In this type of psychographic categorization, we take all humans and first divide them into conformists vs. non-conformists, and then them into aggressive and non-aggressive, so we end up with four different groups of people. In my estimation, the first and largest group are the non-aggressive conformists, which I will refer to as sheep. Next is size are the non-aggressive non-conformists, who I shall refer to as beavers. Next are the aggressive conformists which will be referred to as the wolves, and finally the smallest group are the aggressive non-conformists, which are going to be the tigers. The labels really don't matter, you can refer to them as non-something somethings if you like. Sheep, as the name implies are a herd animal that likes to stay within a group, becoming very uncomfortable when separated from the herd, and have difficulties making decisions on their own. Herd mentality takes over, and they are basically happy to graze with their fellow sheep, doing what their neighbour is doing. The main predator that feeds on sheep are wolves, and therefore a lot of effort of the sheep is spent on making sure they are in a position that makes them least likely to become wolf food. The centre of the herd is a safe place, so position within the group is very important. Sheep don't mind if one of their members gets eaten once in a while, as long as it is not them. As soon as the predator has feasted, the Sheep will once again bow their heads down and get back to eating. Business as usual. But while the herd is circled by predators, the sheep will do their best of avoid the predator, but will not do anything like banding together to fight the common enemy. Sometimes I believe sheep actually appreciate it when the predators finally caught one of their neighbours, because now they can go back to their lives, and don't need to worry, until the next time. Wolves are the conformist predator. Like sheep, wolves live in a group, a wolf pack, but the rules are quite different. Where sheep will try to out-good and outmanoeuvre each other, wolves life by violence, and the strongest and most brutal lead the pack. Wolves respect only force, and hate any sort of weakness. They like to hunt, and they like to kill, even their own, but they hunt and kill as a pack, not individually. One side note I would like to make here on something called the Contrarian. A Contrarian is not the same as a non-conformist, because a Contrarian is actually a conformist in reverse. The person looks at what the group does, and does the exact opposite. But he or she still has a reference point on how to make decisions that is based on the group, so he or she is still very much part of the group. Contrarians are easily confused for non-conformists, except that after a while, you will notice the non-conformist will sometimes be on your side, and sometimes not while the contrarian is never on your side. Beavers are non-conformist non-aggressive. One can consider a beaver prey, but as they mainly stick to themselves, hiding in damns under water in small families, they don't make easy prey, and besides, the wolves prefer sheep. Beavers like to do their own thing, and don't like to be bothered, or bother others. Many of them like to build things, like damns. Tigers are non-conformist aggressive, a solitary predator. This is the smallest group, and like the Beaver, this predator like to do their own thing, not be conform to a group, but unlike the Beaver, this animal lives from the work of others. Obviously tigers also consume, both sheep and beavers, but as they are so few in numbers, they are not the constant concern of the prey. 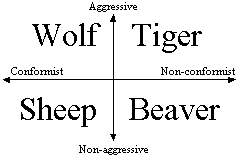 All of these different types of animals, or personality types can be found in an average sized corporation. If you work for one of those and you look around yourself, you will be able to picking out who is what. From there you will be able to predict their reaction to different types of situations. Most of the employees will fall into the sheep category. When the wolves are on the prowl, to see who to fire or lay off, the sheep will keep their heads down and patiently wait for one or more of their number gets canned. The wolf has no issue with firing half of the staff and then paying himself or herself a bonus, that is just what wolves do. You have engineers and technicians off by themselves hiding in some back-room, designing and building things, and generally want to be left alone, not really mix with the office politics. If you are lucky as an employee, you will have a shepherd heading up your department or even the company. They demand product, but they will protect you as useful livestock. If on the other hand you have an alpha wolf running the company, then it's pink slips for the sheep and golden parachutes for the fellow wolves. The important thing for the sheep to concentrate on is to make sure they are in the middle where it's safe, because the people on the outside, anybody not part of the core group is more likely to get fired or laid off. So, politics are very important to make sure you are in the middle, not noticeable from the outside. You never want to draw attention to yourself. One of the most difficult things for people to do is to accept their category. When in the past I have presented this system, people always ask me what I think they are. I don't answer that question anymore because, let's face it, most people are sheep, but nobody wants to admit being a sheep. But let's face it, when backed into a corner, would you die fighting, or would you whimper and beg for mercy? Most people will beg. And when everybody says something is write, do you go against the flow, stand up and say that it's actually wrong? The other difficult part is that, once people have come to terms with who they are, they should not try to be something they are not. Sheep who run with wolves quickly become desert. Sheep, when by themselves, feel isolated and alone. Tigers trying to be sheep are never accepted into the herd, and will always be outsiders. And sheep can sense a wolf from miles away. Beavers should not attempt to play politics because they simply don't understand them, and neither should tigers. Be who you are. Crossing over is very difficult to do, and most of the time not successful. A healthy ecosystem actually needs all of these groups to continue to thrive. If the world is only populated by sheep, then starvation is the next step, and mass death inevitable. All members are required to make the world go round, and none is worse than the other, or better than the other, as long as everything is within balance. So, once you have digested who you are, look around yourself and try to study who others are. Once you know what you are dealing with, you know who you can count on, who to mistrust, and who to stay away from. Never think that a sheep will stand up and defend you. They are happy as long as they survive. A wolf at your back is a meal ticket invitation. Beavers will not get involved in anything that is not related to building things or producing things, and a Mayor type will gladly sacrifice you to advance their own position. If you are asking for honest opinions, ask the beavers and the tigers, not the sheep and the wolves, because those only tell you what the herd tells them, or what they think you want to hear.